Pennridge wrestler Josh Stillings won the state title at 182. 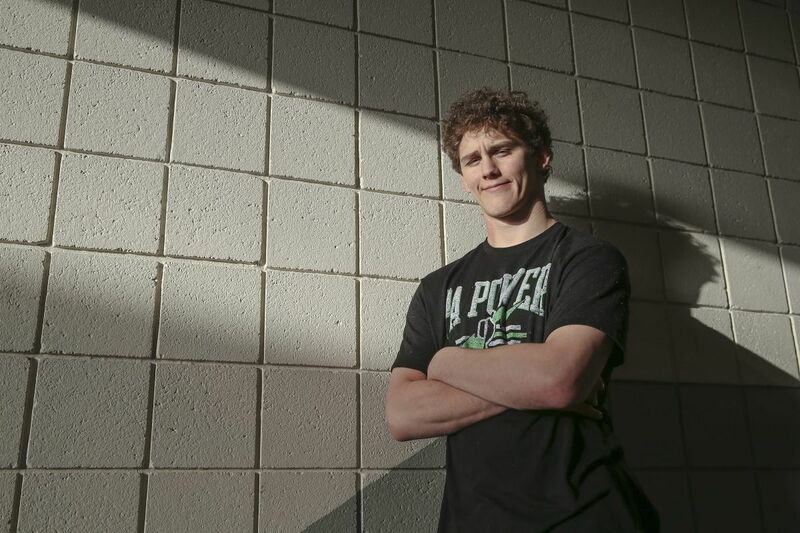 The PIAA Class 3A state individual wrestling semifinals and finals were held at Giant Center in Hershey on Saturday, and Josh Stillings (182 pounds) of Pennridge and Hunter Catka (220) of Sun Valley won championships. Killian Delaney (113) of West Chester Henderson and Doug Zapf (120) of Downingtown West advanced to the finals but lost by decisions. The event's outstanding wrestler was Sam Sasso of Nazareth. 106 – Alejandro Herrera-Rondon, Seneca Valley dec. Kurtis Phipps, Norwin, 1-0 UTB. 113 – Ryan Sullivan, Shaler dec. Killian Delaney, West Chester Henderson, 4-3. 120 – Logan Macri, Canon-McMillan dec. Doug Zapf, Downingtown West, 3-2. 126 – Sam Hillegas, North Hills dec. Chris Wright, Central Dauphin, 4-2. 132 – Jeffrey Boyd, McDowell dec. Colton Camcho, Franklin Regional, 5-4. 138 – Ryan Anderson, Bethlehem Catholic tech. fall Seth Koleno, Bald Eagle, 20-4, 4:34. 145 – Sam Sasso, Nazareth pinned Kolby Ho, DuBois, 5:22. 152 – William Evanitsky, Scranton dec. Gage McClenahan, Bald Eagle, 5-2. 160 – Carter Starocci, Cathedral Prep dec. Zach Hartman, Belle Vernon, 6-4 OT. 170 – Trent Hidlay, Mifflin County dec. Luke Nichter, Chambersburg, 11-5. 182 – Josh Stillings, Pennridge dec. Tim Wallace, Albert Gallatin, 3-1. 195 – Luke McGonigal, Clearfield pinned Cole Urbas, State College, 1:37. 220 – Hunter Catka, Sun Valley dec. Parker McClellan, Altoona, 7-5. 285 – Isaac Reid, Kiski Area dec. Kawaun DeBoe, Cathedral Prep, 3-1. 106 – Tal-Reese Flemming, Liberty dec. Matt Mayer, Bethlehem Catholic, 5-4. 113 – Kyle Burkholder, Hempfield pinned Cole Wilson, Northeastern, 3:29. 120 – Sean Pierson, Nazareth dec. J.J. Wilson, Cedar Cliff, 2-0. 126 – Dalton Rohrbaugh, Spring Grove dec. Kenny Herrmann, Bethlehem Catholic, 7-5. 132 – Devon Britton, Bethlehem Catholic dec. Andrew Wert, Central Dauphin, 5-2. 138 – Noah Levett, Kiski Area dec. Paul Feite, Northern York, 4-2 UTB. 145 – Ryan Vulakh, Pope John Paul II dec. Micah Hoffman, Northern York, 5-0. 152 – Luke Kemerer, Hempfield pinned Daniel Mancini, Owen Jr. Roberts, 2:40. 160 – Gerrit Nijenhuis, Canon-McMillan dec. Luke Stout, Mt. Lebanon, 3-0. 170 – Cade Wilson, Nazareth dec. Jesse Quatse, Greensburg Salem, 3-0. 182 – Max Shaw, Thomas Jefferson dec. Christian Sequete, Butler, 7-2. 195 – Jake Koser, Northern York dec. Elijah Jones, Boyertown, 7-5. 220 – Greg Bensley, Pocono Mountain West dec. Cole Forrester, Shippensburg, 5-4 UTB. 285 – Gerald Brown, West Mifflin pinned Michael Wolfgram, Central York, 1:43. 106 – Kyle Waterman, Council Rock South dec. Ben Monn, Cumberland Valley, 2-0. 113 – Matt Maloney, Liberty dec. Andrew Smith, Nazareth, 6-3. 120 – Wyatt Henson, Waynesburg dec. Cameron Enriquez, Stroudsburg, 3-1 OT. 126 – Jacob Ealy, Hopewell dec. Gabe Willochell, Latrobe, 11-5. 132 – Nick Coy, Penn-Trafford dec. Tyler Williams, Souderton, 3-0. 138 – Cameron Robinson, Council Rock North dec. Nathan Stefanik, Nazareth, 9-2. 145 – Job Chishko, Penn-Trafford dec. Cole Handlovic, Bethlehem Catholic, 8-3. 152 – Clayton Ulrey, Lower Dauphin dec. Ty McGeary, West Allegheny, 8-6 OT. 160 – Jacob Burgette, Scranton dec. A.J. Wilson, Solanco, 10-3. 170 – Scott Joll, Belle Vernon dec. Maximus Hale, Downingtown West, 8-5. 182 – Donovon Ball, Cedar Cliff dec. Josh Krieger, Shikellamy, 6-3. 195 – Dorian Crosby, Cathedral Prep dec. Nathan Ansell, Connellsville, 3-1. 220 – Ian Edenfield, Laurel Highlands dec. Denny Karas, Exeter, 2-1. 285 – Garret Zobel, LaSalle College dec. Ryan Stewart, Warwick, 3-1 OT. 106 – Matt Sarbo, Altoona dec. Matt Vulakh, Pope John Paul II, 6-1. 113 – Will Betancourt, Manheim Central by injury default Christian Fisher, Mifflin County, 0:03. 120 – Louis Newell, Seneca Valley dec. Paniro Johnson, Cathedral Prep, 7-1. 126 – Caleb Morris, Waynesburg dec. Gunnar Fuss, Harry S. Truman, 5-3 OT. 132 – Ben Radner, Council Rock South by medical forfeit Jonathan Miers, Easton. 138 – Zach Ortman, Parkland dec. Leno Ciotti, McDowell, 4-2. 145 – Cam Connor, Kiski Area dec. Alex Hornfeck, Mars, 2-1. 152 – Luca Frinzi, Bethlehem Catholic dec. Cole Spencer, Pine-Richland, 6-4. 160 – Patrick O'Neill, North Penn pinned Ethan Baney, South Western, 1:14. 170 – Ben Root, Solanco dec. Tyler Mousaw, Unionville, 9-6. 182 – Brendan Shaffer, Lower Dauphin dec. Mason McCready, Hollidaysburg, 3-2. 195 – Yusuf Aladinov, William Tennent pinned Mitchell Talbott, Central Dauphin, 2:37. 220 – Jake Slinger, Upper St. Clair dec. Nate Schon, Selinsgrove, 7-5 OT. 106 – Kurtis Phipps, Norwin dec. Ben Monn, Cumberland Valley, 4-1; Alejandro Herrera-Rondon, Seneca Valley dec. Kyle Waterman, Council Rock South, 4-1. 113 – Ryan Sullivan, Shaler dec. Matt Maloney, Liberty, 5-2; Killian Delaney, West Chester Henderson dec. Kyle Burkholder, Hempfield, 5-1. 120 – Doug Zapf, Downingtown West dec. J.J. Wilson, Cedar Cliff, 1-0; Logan Macri, Canon-McMillan dec. Sean Pierson, Nazareth, 5-2. 126 – Sam Hillegas, North Hills pinned Jacob Ealy, Hopewell, 1:51; Chris Wright, Central Dauphin pinned Gabe Willochell, Latrobe, 0:36. 132 – Jeffrey Boyd, McDowell dec. Andrew Wert, Central Dauphin, 2-1; Colton Camcho, Franklin Regional dec. Tyler Williams, Souderton, 8-4. 138 – Seth Koleno, Bald Eagle dec. Paul Feite, Northern York, 3-1 TB2; Ryan Anderson, Bethlehem Catholic dec. Noah Levett, Kiski Area, 3-1. 145 – Sam Sasso, Nazareth major dec. Ryan Vulakh, Pope John Paul II, 11-1; Kolby Ho, DuBois dec. Micah Hoffman, Northern York, 8-7. 152 – Gage McClenahan, Bald Eagle dec. Ty McGeary, West Allegheny, 7-5; William Evanitsky, Scranton dec. Clayton Ulrey, Lower Dauphin, 5-4 TB2. 160 – Carter Starocci, Cathedral Prep dec. Gerrit Nijenhuis, Canon-McMillan, 3-1 OT; Zach Hartman, Belle Vernon dec. Luke Stout, Mt. Lebanon, 6-0. 170 – Trent Hidlay, Mifflin County major dec. Scott Joll, Belle Vernon, 13-5; Luke Nichter, Chambersburg dec. Cade Wilson, Nazareth, 6-4. 182 – Josh Stillings, Pennridge dec. Josh Krieger, Shikellamy, 7-2; Tim Wallace, Albert Gallatin dec. Max Shaw, Thomas Jefferson, 7-0. 195 – Cole Urbas, State College pinned Nathan Ansell, Connellsville, 1:57; Luke McGonigal, Clearfield pinned Dorian Crosby, Cathedral Prep, 1:10. 220 – Hunter Catka, Sun Valley dec. Ian Edenfield, Laurel Highlands, 6-5; Parker McClellan, Altoona dec. Cole Forrester, Shippensburg, 4-3 TB2. 285 – Isaac Reid, Kiski Area dec. Ryan Stewart, Warwick, 7-0; Kawaun DeBoe, Cathedral Prep dec. Michael Wolfgram, Central York, 5-2.